Yesterday was day 2. Yesterday’s challenge (which I’m just putting up today due to a busy day with blogging and not wanting to post more than anyone could possibly read… or care about reading) was to build a fort with your kid. I was nervous. A fort? Really? We didn’t have couch cushions that came off… But then I realized that we did have back cushions that came off the couches. There was a potential for awesomeness here. 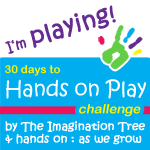 And it would probably run longer than 15 minutes, which is the minimum amount of time for the toddler play challenge. All would be awesome and right with the world as Norton crawled around under the coffee table and cushions. The fort attempt was more in line with our flops. First, Norton freaked because I took the cushions off the back of the couch. And then he really went bananas when I used his blanky in the making of our fort. I tried to demonstrate the tunnels… but it turns out that trying to slide through tunnels on your belly at one day shy of nineteen weeks pregnant is really difficult. My symphysis pubis dysfunction was also making it clear that, no, I should not be doing these things. So two minutes into that fifteen minute attempt at toddler play, we scrapped the fort idea. Really, the goal is to have fun with my kid, right? Rather than stick to a plan so rigidly that we’re both miserable? I quickly put the cushions back. Norton and I sat together on the love seat (while he clutched his blanket) and read a little story together. Then we spent some time playing ball. That mostly went well, except when he threw the ball in my face and smashed my glasses against my head. That kind of hurt. But we quickly recovered and continued playing. 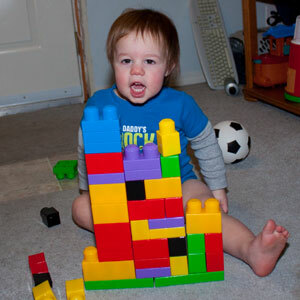 After that, Norton decided that it was time to play with Legos. We have a few blocks that we keep in his toy rack in a bucket… but all of them don’t fit. Mom got brave and dumped out the blocks that were put away, too. Norton and I proceeded to build the most structurally unsound wall in the history of the world. An engineer would have sobbed. But you know what? We had fun. Lots and lots of fun. So much fun that we kept playing together after that fifteen minutes was up. It may not have been a fort, but we definitely built something together. That’s what matters, right? Day 3 is the perfect one for us. 🙂 Have to get that blog post up! Ha, I’m so glad you posted this. Makes me feel better at my attempts to play. I hvent exactly had success as I had envisioned the first few days with this challenge either. But you give me courage to blog about it. Isn’t it nice to know that you’re not the only one who finds things working out not exactly as planned?